It’s September! Back to school and to the office! After releasing the Mirambell skirt and Lliria dress this summer, I wanted something easy and fast to make to start September nicely. So let me introduce the Faura top and dress pattern! The Faura pattern has front and back princess seams for a fitted bust and then flares just below. Cinched at the waist with D-rings details, it closes in the back with an eye and hook. View A is a blouse with hip length and short sleeves, while view B is a short sleeveless dress with a central pocket. 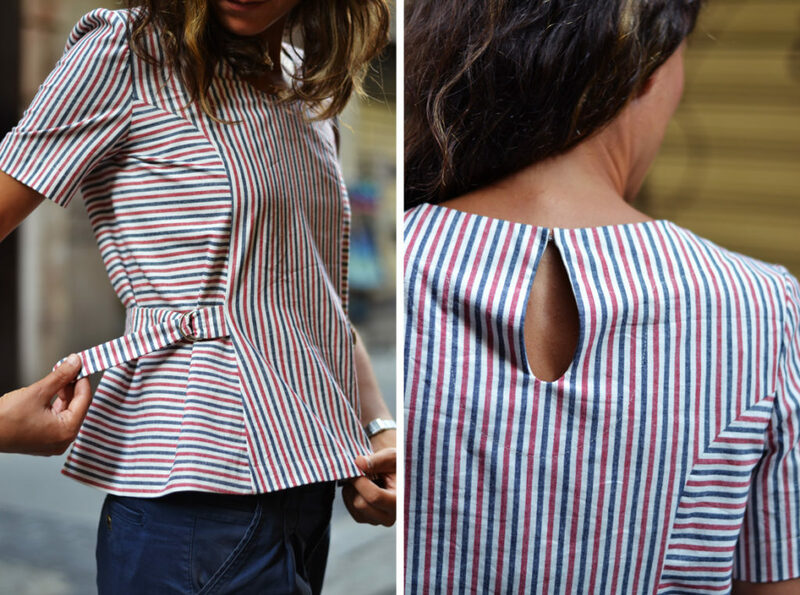 Perfect for a beginner, it’s easy and fast to make: in a few hours you’ll have a pretty blouse or dress. This basic pattern, with its sixties details, will look ideal with denims or a casual jacket for an easy-going look perfect to ease back into September. The Faura blouse and dress pattern is available as a PDF pattern here, with print-at-home and copyshop printing options. Once your order is complete, you’ll find it in your personal account for illimited downloads and it will also be sent to your email (remember to check your spams!). For fabric, you have a very wide choice. We recommend light to medium weight fabrics such as cotton, linen, rayon, chambray, crepe or even a light wool for the start of winter… We’ve used a striped cotton for view A and a soft chambray for view B, both from the Valencia shop Bye Bye Manoni. I’m looking forward to see what you have in mind for the Faura pattern! Don’t forget to share your projects with the hashtags #paulinealicepatterns and #FauraTopDress. The new Spring patterns are here! Waw!! Énorme coup de coeur !! Moi qui cherche un patron de top depuis longtemps… Celui-ci me séduit beaucoup !! Merci Suzanne, contente que le haut Faura vous plaise! Really nice pattern.Fall in love with the red and blue strips.Definitely going to be in my wardrobe.I like sewing different style and pattern.This gave me help in selecting the pattern and material. Great! You look nice on that dress! I want to make some dresses DIY tutorial and one for my B. I would get this pattern. Or do you have a DIY on how you made this dress..
Really nice pattern. Definitely going to be in my wardrobe.I like sewing different style and pattern.This gave me help in selecting the pattern and material. Fall in love with the red and blue strips.Definitely going to be in my wardrobe.